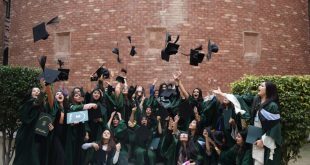 LAHORE (staff report): University of Management and Technology (UMT) conferred undergraduate, graduate, MS/MPhil and PhD degrees upon 590 students during the varsity’s 15th annual convocation held here on Thursday. Gold medals, special awards and cash prizes were also given away among the graduates for their excellent performance in exams, curricular and extracurricular activities. As per the details, 247 BS, 79 Masters, 263 MS/MPhil and 1 PhD degrees were distributed among the graduates while the number of total gold medals remained 33. UMT Rector Dr Muhammad Aslam highlighted the key achievements and salient features of the work by presenting the annual report of the varsity. He said the UMT was moving in the right direction as per its vision, mission and objectives of contributing to sustainable human development. Addressing the convocation, ILM Trust and UMT Chairman Dr Hasan Sohaib Murad congratulated the graduates, parents, and teachers for achieving one of the critical phases of their life. He said that the knowledge empowered us to unlock our potential and shape a positive future of the country by actively contributing to all sectors including the economy and social harmony. Dr Murad urged the students to continue the process of learning with passion and apply the gained knowledge for the betterment of humanity. Later on, he gave away degrees and gold medals among the graduates. Renowned scientist Ansar Pervaiz who is the former chairman of the Pakistan Atomic Energy Commission and former chairman of the Board of Governors of the International Atomic Energy Agency also attended the event as the guest of honor. Speaking on the occasion, he urged the students to work hard with an aim to serve the country. He said Pakistan was rich in natural resources and we had to use willpower to put the country on the road to progress and development by utilising the resources. UMT Director General Abid H K Shirwani, members of the UMT Board of Governors, deans, directors, the registrar and controller of examinations were also present on the occasion. After the event, students, teachers, parents and guests chanted slogans of “Jeeway Jeeway Pakistan” to commemorate March 23 – the Pakistan Day – and to express unity. Expressing their views, some of the graduates said that they were very excited to receive the degrees on the eve of March 23, as they would celebrate it with traditional zeal and enthusiasm.